Serve up your business cards with kinetic, Steampunk style. 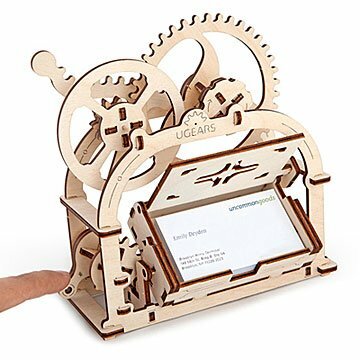 This clever contraption serves up your business cards with steampunk style. You'll get clients' and colleagues' attention, but half the fun is in making the mechanical valet with this DIY kit. Assemble 61 laser-cut, Baltic birch pieces to create a kinetic sculpture that tips open with a push of the lever. With a nod to the absurd machines of inventor Rube Goldberg, the desktop sculpture is a great way to focus your fidgeting and present your cards with a flourish. The all-wood kit requires no glue or hardware. Made in Ukraine. I have not put it together yet, but I look forward to doing so. I love that it is made of wood and that it is mechanical. It will be something very unique to put my business cards in on my desk at the office. Great on a desk and even better to assemble! Well designed - parts fit very well. No problems and thoroughly enjoyed it! This was purchased as a gift for a colleague getting back in the tabletop gaming industry. They're also a tinkerer so I thought this was an excellent choice considering you first build the cardholder then use it. I like that it is functional yet also art in a way, and think it will be a great conversation piece on their new desk. Well crafted, relatively easy to asemble and it works. My husband enjoyed the gift that was something different than the usual. I've purchased from Uncommon goods before and the items never disappoint! The only issue I have is the mechanism for lifting, does not lift correctly. You have to help keep the gear on track. This item was purchased as a graduation gift. The graduate is starting a new job, and the Moving Card Holder Kit will be perfect for all of those business cards. Bought it for my boyfriend who can't wait to put it together and use it!